This was the year I discovered Inna Semetsky and fell in love with her mind and soul. My #1 pick for Tarot reading in 2011 is her latest book Re-Symbolization of the Self — Human Development and Tarot Hermeneutic. In my own mind and heart, I have felt the urgency of developing a scholarly approach to explaining the psychological workings behind Tarot as a phenomena and powerful tool for growth. 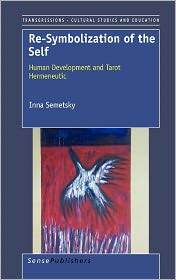 Semetsky has far exceeded my abilities and I am thrilled to see her dedication to the in-depth research, writing, and promotion of the science and validity of Tarot cards and reading. Re-Symbolization of the Self explores the relationship between outer images, in this case Tarot cards, and inner psycho-spiritual processes. Drawing from the insight and teaching of writers, such as Carl G. Jung’s transcendent function, Semetsky captures the dreaming process in many of it’s aspects to reveal what really goes on between object and subject in the creation of meaning. Semetsky’s research touches upon the works of Plato, Plotinus, Giordano Bruno, Valentin Tomberg, Martin Buber, Sigmund Freud, Carl Jung, Joseph Campbell, James Hillman, Abraham Maslow, Carl Rogers, Peotr Ouspensky, David Bohm, Rupert Sheldrake, Nel Noddings, Ervin Lazlo, Erich Jantsch, Robert Romanyshyn, Gilles Deleuze , Mary Greer, Emily Auger and Robert Place, among others. “This book originated as an action-research project conducted between 1992 and 1994 under the auspices of the California Board of Behavioral Sciences when I was a postgraduate student enrolled in the Masters of Arts degree program in the area of Marriage, Family and Child Counseling and Human Development at Pacific Oaks College in Pasadena. Unbeknown to me at the time, my study was to be a type of research analogous to what Jungian scholar Robert Romanyshyn will have called more than a decade later “research with soul in mind” (Romanyshyn, 2007). Yet back then in 1992 I was not only ten years away from the subject matter of my future doctorate in the area of philosophy of education and cultural studies, but also quite undecided on the topic of my Masters thesis that was eventually to be called Introduction of Tarot readings into clinical psychotherapy: a naturalistic inquiry. “In the area of human development, which is the focus of this book, the rigid boundaries between those apparently separate, in the contemporary context, disciplines of education and therapy become blurred: both are oriented to creating meanings for our experience that includes the realm of the yet unknown and unconscious. 1. The “relational world view” of interdependence, analogy or correspondences between phenomena. 3. “Transmutation” is an inner alchemy concept used metaphorically to represent human spiritual development, as with Jung’s concept of individuation of the Self. 4. Semetsky connects the hermetic concepts of “concordance and tolerance” with Jung’s theory of the collective unconscious, a place where we transcend language, cultural, and belief system barriers to connect with inter-communication and mutual understanding. 6. “The natural world is not reduced to ‘dead matter’ but is alive.” Tarot helps to remove the veil of the invisible realm of life much like The World card expresses the quintessence of including this fifth element. Virtual Field of Becoming – Gilles Deleuze’s philosophy suggests the virtual field of becoming “is as real as the actual plane of manifested phenomena, and an object of experience is considered to be exist only if its tendency to exist in its virtual, potential form.” (p. 61) Semetsky postulates this virtual field to include Jung’s archetype of the Shadow. Chapter 4 “HUMAN EXPERIENCE AND TAROT SYMBOLISM” explores the “Hero’s Journey” with Jungian sensitivity to the allegory of each archetype of the Major Arcana. Chapter 8 “STORIES LIVES TELL” includes 15 case studies with visuals of the Tarot cards laid out for each Celtic Cross spread along and the formulated feedback received from the individual participants in Semetsky’s study. All quotes are by Inna Semetsky from this book and I thank her for extending her gracious permission.